The SR75 Sling Bar Stool is a premium outdoor bar stool and is Made in the USA! The SR75 Sling Bar Stool features a full sized seat, a distinctive flat armrest crafted from extruded aluminum, and a sling seat made from premium fabric. 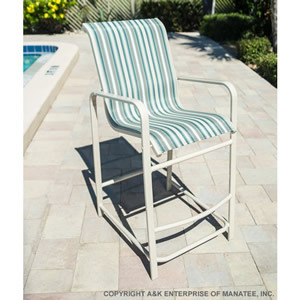 The SR75 Sling Bar Stool is part of our patio bar furniture line and may be customized in any frame and fabric selection from our extensive catalog. Request Your Quote for the SR75 Sling Bar Stool Today!